Sign up for our newsletter - hear about new products, special offers, classes & events. 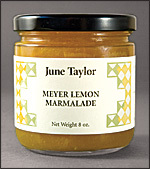 Our Marmalades are intense in flavor and range from piquant and refreshing (Meyer Lemon and Lime, Silver Lime & Ginger, Seville Orange), to tangy and bright (Grapefruit & Meyer Lemon), through soft, full bodied sweeter styles (Blood Orange). All are enjoyable at breakfast time and make wonderful glazes for meat or fish. Meyer Lemon & Mint New! We are continually adding new varieties produced in small quantities. Please check this site for new additions. 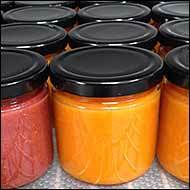 Four times a year receive three carefully selected conserves, marmalades, and fruit butters made during that season. One year subscription includes four shipments of 3 jars (12 in total) and includes shipping.